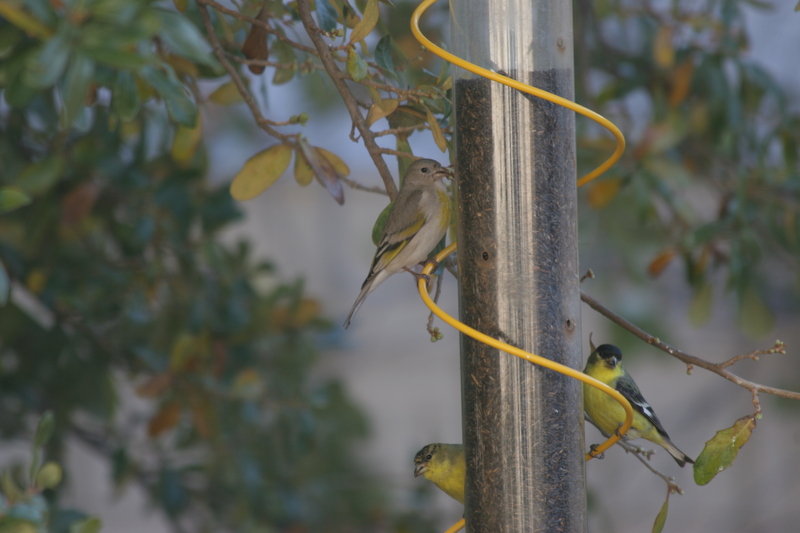 Do Bird Feeders Attract ‘Pack’ Rats and Spread Disease? A ‘Letter to the Editor’ published in February’s TWO’S NEWS, the monthly newsletter for SaddleBrooke’s homeowner’s association HOA 2, claims that “unknowing homeowners” have created a problem for all of us by placing bird feeders in their yards. 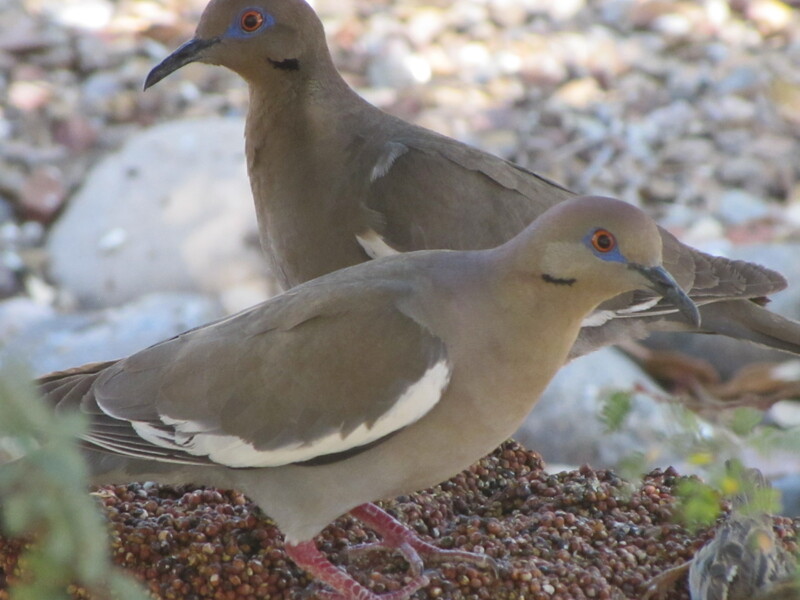 The writer states that feeding birds, though popular in other places, is not appropriate in a “desert environment” because pack rats, attracted to bird seed, wreak havoc on wiring, BBQs, hot tubs, fountains, cars, attics, roofs and furniture. The letter writer then suggests that the HOA 2 Architecture and Landscaping Committee (ALC) provide all new residents with a copy of a proposal to the ALC written by one or more HOA 1 residents in 2006. The proposal, which is included in its entirety in the letter, calls for a total ban on bird feeders. It goes to considerable length to justify this, based mostly on the risk of disease, but also claiming that feeders attract pack rats, snakes and neighborhood cats, and lead to costly broken windows from flying birds. The proposal was not supported by any sources or cited references, and was not adopted. Why would someone suggest official distribution to all new residents of a five-year old un-adopted proposal that contradicts SaddleBrooke’s ALC Guidelines and Requirements? Most of the claims made in the proposal are false, probably why it was rejected in 2006. Nevertheless, some people remain misinformed about bird feeders and rats, and others might be frightened by warnings of infectious diseases contained in the reprinted proposal, suggesting the need for some clarification. Are Pack Rats Drawn to Bird Feeders? The simple answer is no. I have bird feeders, and, from time to time, I have rats. If you and your surrounding neighbors have no bird feeders, in all likelihood you will see at least as many rats as I do. The rat found in SaddleBrooke is the white-throated woodrat (Neotoma albigula), which is common to the Southwest, where it has lived long before any human moved in. Woodrats dine almost exclusively on cactus and woody vegetation. They get their water from cactus, as well, and typically make their home among cholla or prickly pear in order to be close to their food and water. They also seek out dark hiding places, such as beneath a BBQ cover, in an attic or a car. You can easily recognize these hideouts, because the rats hoard food in them. If you discover one, you will find pieces of cactus, cholla and prickly pear fruit, acorns, mesquite and bird of paradise seed pods, sticks and newspaper. I’ve found all of the above in the dens I discovered, but I have never found birdseed. Woodrats are certainly annoying, and they can indeed do damage to insulated wiring. Since we share their habitat, we’re not likely to get rid of them, but there are steps we can take to minimize their presence. 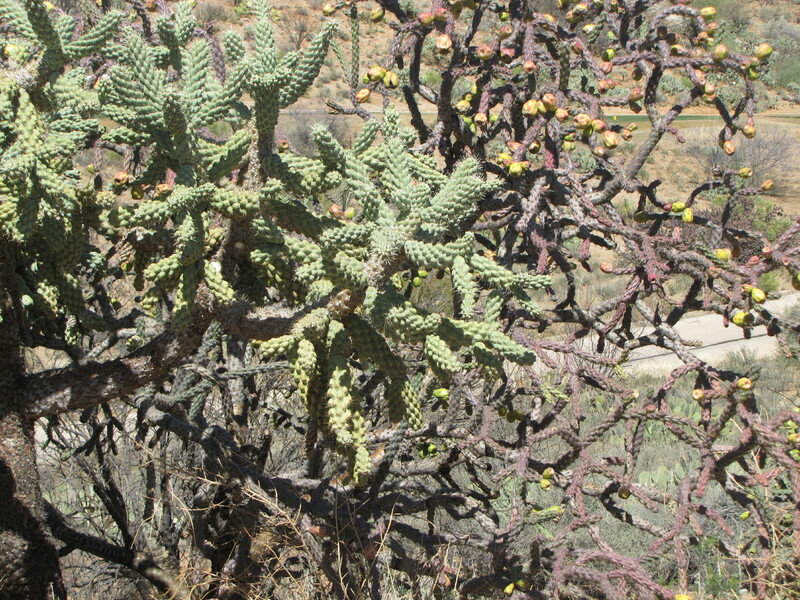 Cholla and prickly pear provide both food and shelter to woodrats, while oak, mesquite and other seed pod producing plants are additional food sources. Planting fewer of these plants will make your yard less attractive to rats. You could also reduce hiding spots and clutter, and get rid of your BBQ cover. Insure that your roof eve openings are impassable, and keep your car inside the garage. These steps will reduce your contact with woodrats, but nothing is going to eliminate them. Rodent poisons are a terrible idea, because they are slow-acting, and are very likely to kill rat predators like Great-horned Owls. Dead, decomposing rats in your attic aren’t pleasant either. The best solution is to use a spring-loaded or live trap, which are effective and available for about $40 at local hardware and do-it-yourself pest control stores. Bait live traps with a single Reese’s peanut butter cup, and release captured rats on state land outside of SaddleBrooke. The owls will love you for it. I keep one set year-round, although I rarely see any rats except in spring, when they are most active. If you don’t want to get involved personally, hire an exterminator, but insist that he use live or spring-loaded traps instead of poison. What about Snakes and Mice? Snakes do like to eat woodrats, as do owls, bobcats, coyotes and ringtails. For the most part, this is good, not bad. If you see a gopher snake in your yard, it most likely means that the one or two woodrats you had are gone or going soon, and the snake will then move on. The grasshopper mouse, common in our area, is a carnivore that doesn’t eat seed of any kind, bird or otherwise. He’s a vicious predator that craves grasshoppers and scorpions, the kind of rodent you might want to keep around. The 2006 proposal went to great lengths suggesting that bird feeders contribute to the spread of multiple diseases, especially salmonellosis and Avian influenza, and claimed that humans, dogs and cats were at significant risk. Salmonellosis, or salmonella, is a bacteria-based disease that affects animals, including birds and humans. According to the National Institute of Allergy and Infectious Diseases (NIAID) and other comparable sources, human infections of salmonella are tied to food products, such as raw poultry, eggs, beef and unwashed fruit, as well as through contact with pets, particularly pet reptiles, such as snakes, turtles and lizards. Birds are not listed as an infection source. However, birds are also susceptible to salmonella infection, which can be spread through contact with other infected birds or feces-contaminated food or water. Salmonella infection in birds is characterized by large numbers of dead and dying birds. I’ve not seen that here, but you should protect birds against salmonella by keeping bird feeders dry and cleaning them regularly with a 10 percent bleach solution. Cats should not be allowed to run free to eat a possibly-contaminated bird, but free-running cats in SaddleBrooke have much more to worry about than sick birds. Avian influenza also was emphasized in the 2006 proposal as a threat to humans, although this virus has not been found in humans or wild or domestic birds in North America. Birds are a natural part of our environment, and we are fortunate to live in southeast Arizona, one of the country’s most highly-regarded birding destinations. Suburban developments like SaddleBrooke encroach on wild habitat, and can negatively impact native populations of birds and other animals. By setting out bird feeders, keeping them clean and dry and replacing food every week or two, you can supplement diminished natural food sources and attract some of our special birds to your yard without being a nuisance to your neighbors. Woodrats are far more interested in cactus and clutter than birdseed. This entry was posted in Wildlife Arizona and tagged Controlling Pack rats, Desert Birds, seed feeder-related problems, white-throated wood rat. Bookmark the permalink.